"The musical imaginary world of Bob travels across different continents, the nylon strings of his guitar going together with his own vocal strings, used as a second instrument. All this creates a great lyrism "A fleur de cordes", a french expression meaning "very close to the skin" and which is the tittle of a very beautiful piece dedicated to the artist's mother...To be visited with real confidence." "You are such a great singer and also a good player. Get together with guys like Richard Bona, Raul Midon, Lionel Louetke, or even Pat Metheny, and create together something fantastic !!!" 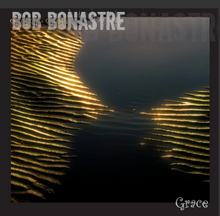 "Bob Bonastre's last album, "Grace", produced by the inescapable Acoustic Music Records, is a travel around his planet "Music". The harmonies and the unusal scales are developed with sensitivity, into refined but also full of life pieces. Despite undeniable work of writing, the whole thing keeps a naturalness extremely seducing. Here is a strange mix of introspection and joy of living, that should please as much the acoustic guitar lovers as these who, much many(...), are looking for authentic and personnal music. 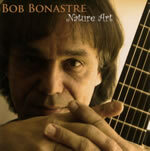 Bob Bonastre sings, well and with an impressive range, and plays on a nylon strings guitar. His play has none of these devastating effects made to impress the audience. And even aÂ bright and cheerful piece as "Summer Joy"does'nt swagger. I'm pretty sure that, played by someone else on metal strings (he will have to be really good) it would be a real piece of anthology. But not here...One can listen to the music without being disturbed by the "tour de force"of the guitarist. Finally, here are my favorite songs among the ten little jewels of this album. As the choice was hard, I took five of them, as the fingers of a hand. a magnificent piece from Egberto Gismonti. the evidence of hapiness...It was not obvious! a magnificent song! Will there be a poet to write the text? an inspired and surprising version of a song from the great Jimi Hendrix"
"Grace" is maybe one of the most beautiful word in english. Different nuances resonate depending the context: beauty, dignity, kindness, delicacy, elegance and divine grace. And that's by grace that french guitarist, Bob Bonastre, seems to have been touched... One can be sure that, even in his sleep, he would be able to improvise on any jazz standard, but he is looking for something else in his acoustic albums: a synthesis of Flamenco, Folk and African Music, which brings the listener to a state of deep serenity and trance without hower being exhausted or invaded by meditative superficial states. And Bob Bonastre definitly makes it..."
"A very beautiful record by Bob Bonastre, that I would rate as highly as those by the acclaimed masters of the nylon string guitar such as Ralph Towner or Egberto Gismonti.He is to be congratulated for his originality and for the ever-present search for new musical frontiers expressed in his music"
"Thank you for your poetry and your music!For the feather and the mountain..."
"Thanks to its unfailing taste and masterly musicianship , Nature Art finds easily its way on to the turntable more often than some. Definitely worth listening to." " Bob Bonastre is a creator of atmosphere, varied with stirring killer chops. His music cherishes ones heart, along with astonishing guitar techniques and the beauty and intenseness of emotions." "In my opinion,art does not exist in nature. It's our vision which first creates the translation of reality that we call "Art". This probably comes from our will to understand the incredible energy of the universe which, I believe,also had to be created... By lending form to a part of this energy, we become shamans,or artists..."
Fusing together elements of jazz and North African music with passion and excitement, Bob Bonastre brings a dynamic and innovative voice to the world of nylon string guitar. "It may be only his second solo album, but Bob Bonastre has pulled one out of the hat that reflects surprising maturity... Just give it a try. Let yourself be swept away by delicate, syncopated arpeggi from Bamako and the poetic moan of the Sirocco wind, with sand in your eyes but a tranquil heart. Then nearly an hours journey later, you leave those strangely familiar spheres and find yourself caught up in the song of the pine-tree (Le Chant du Pin). This blend of cross-fertilising styles from Africa, Brazil, Andalusia, modern-day jazz, classical tremolos and more, never sounds to me like virtuoso playing its just music from beginning to end. Having listened to the album several times, what strikes me most is its profound authenticity and sensitive yet restrained intensity that goes straight to the heart. And another thing: it is rare to hear voice and guitar complementing each other so beautifully." " Thank you for your album that I really enjoyed. A beautiful touch, a fine emotion. Congratulation I wish you good luck ".
" His very rich tonal universe ( classical and electric guitars," prepared "guitar that sounds like a kalimba or, later, as strings softly played with a bow, voices whispered) conjugates with the plural of his melodic and harmonic inspirations. Musics from the soul and the heart, more than the intellect, the " existences" of Bob Bonastre are so much invitations to the inner travels. ".
" 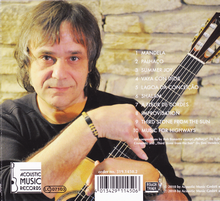 With a solo album ( " Existence ", Acoustic Music Records) which starts by a magnificent piece reminding Egberto Gismonti , in a more accessible way for the reluctant to the Brazilian's boldness, and going on with a Tribute to Ralph that confirms the Towner's colour, the universe of Bob Bonastre takes place in the galaxy of the nylon strings guitar explorers. Sometimes spicy with a discreet electric guitar, his music goes for a walk between " world rhythmic "uncompositions" , classical-contemporary music and introspective jazz .Very beautiful moments, specially for the dreaming ballads and serenity lovers.".
" Three stars for the French Bob Bonastre with "Existence ". Sensitivity, inspiration for an aesthetic close to the E.C.M. atmospheres.
" On this album ,one finds guitar' s sounds a part, which joins percussions ( Kaolack).There is virtuosity in the accelerations. I don't know if angels smile, but our ears get open. " " A very beautiful C.D., with delicate sounds, and to be discovered in several listening." " The melancholic French has the sense of melody, as it' s proved on his very beautiful song " Pour tout l'amour qui fait sourire les anges". (For all the love that makes angels smile).